List of Premier Inn Hotels in the UK. Addresses and room booking form. List of Premier Inn Hotels in the UK. Cheap hotels in Aberdeen, Alfreton, Altricham, Ascot, Barnsley, Basildon, Bedford and Berkswell. View address information and make a hotel room booking at all Premier Inn hotels located in the UK and Ireland. Select a Premier Inn location below or click the view all hotels button below to browse or book rooms in a selection of over 500 Premier Inn hotels in the UK. 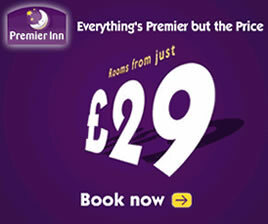 Premier Inn, Derbyshire, England - View hotel information or make a booking. Aberdeen Premier Inn, Westhill, Scotland. View hotel information or make a booking. Aberdeen Premier Inn, Portlethen, Scotland. View hotel information or make a booking. Alfreton Premier Inn, Derbyshire, England. View hotel information or make a booking. Altrincham Premier Inn, Cheshire, England. View hotel information or make a booking. Ascot Premier Inn, Berkshire, England. View hotel information or make a booking. Barnsley Premier Inn, South Yorkshire, England. View hotel information or make a booking. Basildon Premier Inn, Essex, England. View hotel information or make a booking. Bedford Premier Inn, Bedfordshire, England. View hotel information or make a booking. Berkswell Premier Inn, West Midlands, England. View hotel information or make a booking. More Premier Inn hotels (Birmingham to Brentford)..